From Andrew Coulson. Math and reading scores probably underestimate changes in learning (e.g. doesn't account for increased need to teach computer skills in this timeframe). But discourse on education often seems to assume the blue line is flat to down. It is interesting that among the left, this chart is proof that we need to spend more money while the exact same chart in health care (say with scores replaced by life expectancy) is proof we need to spend less money. In fact, the health care chart would look better, because at least there the key metric of quality has increased over time. Update: Here are the life expectancy stats, showing much more progress than education (despite being suppressed by an increasing murder rate in the period -- to really make it a metric of health care you need to pull out accidents and homicides). 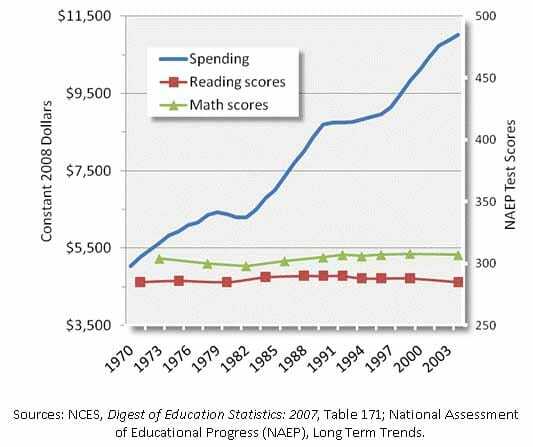 So both health care and education spending go up a lot. Education results show no improvement. Health care results show strong improvement. But education needs more money and health care less? You'd almost think people's opinions on this were based more on feeding government run institutions and starving private ones, irregardless of results. didn't they also makes the tests easier over this period? I would like to see the average salary of teachers (in constant 2008 dollars) overlayed on that graph. 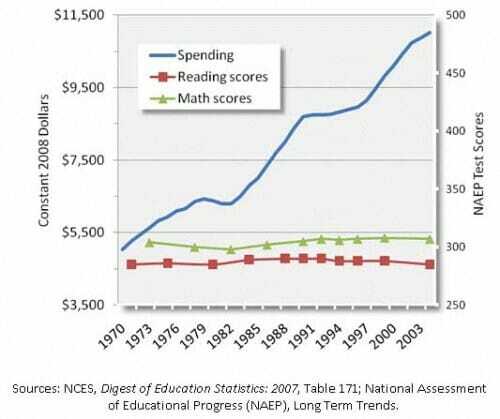 That would really demonstrate the problem of why the doubling of eduacational costs does not lead to improved educational results. The answer is obvious though. The quality of teachers has not improved at all, but their compensation has probably doubled in real terms. "(e.g. doesnâ€™t account for increased need to teach computer skills in this timeframe)"
Um, who gets taught to use a computer? I completely agree with the concept. In Newark, NJ it costs about $17,000 per year to get some of the worst educational outcomes in the country while nearby suburban towns spend 40% less for some of the best outcomes. BUT, that chart is really meaningless without knowing what the scales mean. If you changed the scale on the right to go from 275 to 300, it would look like a surge. In addition the spending should be indexed for inflation. I think a much more telling stat is to compare cross-sectional differences in spending. Can anyone who lives in Los Angeles County and must hear constantly about the trainwreck that is the Los Angeles Unified School District (Come for violence! Stay for the 50% drop-out rate!) and isn't beholden to a union believe this crap? One of the reasons California is in a financial death spiral is that we insanely voted in a law that gave the schools a guaranteed percentage of the state budget. This means in good times the schools get ridiculous amounts of cash that should instead be saved for next downturn. In addition the spending should be indexed for inflation. It is. That's what the "constant 2008 dollars" means. Errr... didn't the population triple during that time period? Spending per pupil in constant dollars would be more honest. I know it has gone up but not by how much. Nevertheless, I agree that the whole premise of spending more on education is nonsense. I went to 1-4th grade in surplus army barracks, set out in the desert at the edge of Albuquerque, New Mexico, with each classroom heated by one oil heater at the front of the room, and class sizes of around 30. @John Moore: He didn't label the axis, but the numbers look more or less like per-student expenditures; I wouldn't be shocked if they are. I amused myself one morning and did some back-of-the-envelope calculations to see what "perfect schools" should cost. I then compared those numbers to what we actually spend, and had a nice long WTF moment. Evil Red Scandi... you are right. I mistakenly thought I saw a B for billion in there. Old eyes with TV blathering in the background. Those do indeed look like per-pupil public school expenditures. I think the schools in this country are doing exactly what they were meant to do: Keep kids busy, inculcate them with pro-State concepts like patriotism and a sense of "civic duty" and prevent them from ever learning how to think. Our schools are great at turning out little drones. But the flip side is that if we ever really taught our children they would know things. Like how corrupt and wicked our government really is. What our military really does in foreign countries. That out "limited Republic" is in reality the largest government in history, and one of the worst behaved. Just witness what happens among the PARENTS if a teacher ever brings up something like what really happened at Hiroshima, or how we really treated the American Indians. If we improved the schools, and taught our children, as soon as they became adults, they would overthrow the system. And that would threaten the adult's neat little world, wouldn't it? As was pointed out in a previous post, education expenditures do not mean the same thing as instructional expenditures. If instructional expenditures per pupil increased in a manner described by the graph proportional to the overall school budget, then we would have a problem and I would suggest checking the drinking water of current students to make sure its not laced with sedatives. Table 165 (page 243)in the 2007 Digest of Education statistics is what I'm looking at for the next couple of statements. Administrative costs have actually decreased in proportion to overall education expenditures, as have instructional costs (both since 1989). You can't blame rising administrative costs as the reason for increasing costs of education if everything else is increasing proportionally--things like capital outlays and the poorly defined "Other Services" in Table 165. The costs of education are rising across the board, and efforts to reduce costs should not just focus one element, but should provide incentives for overall increasing cost effectiveness. Here's something I don't understand. The Teacher's unions state that higher salaries are necessary to attract better people into the profession. They also resist efforts to remove poor and marginal teachers from the classroom (reference the New York School District's infamous "rubber room"). This means that the only effects of raising salaries is going to be to further reward the same poor and marginal teachers who are in place today. I can only imagine my boss' response if when he told me I was a marginal engineer, I replied that for an extra $5k I could be a good one. I think the only question in his mind would be how far across the parking lot I'd slide when he threw me out the front door. The issue is not that we don't spend enough; We're number two per capita in the world. Results wise, we rank about number 25. One problem is runaway bureaucracy. Private & parochial schools typically run about one administrator for every for every 10 to 20 teachers. Our public schools, on the other hand, often run 3 administrators for every 2 teachers. Worse yet, these administrators are paid more than the teachers. Ask a classroom teacher. Worse yet is the corruption. Recently, the Detroit Public Schools canceled direct deposit and required employees to pick up their checks in person and produce identification. Something like a 1,000 "employees" didn't show up. This netted a "savings" of over $10 mega-dollars.